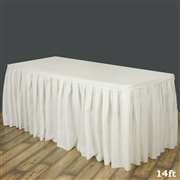 Polyester table cloth perfect for wedding head tables, dessert bars, birthday head table, or dinner parties! please call lori for questions or bookings. 14 feet table skirt covers 3 sides of 6 feet table.